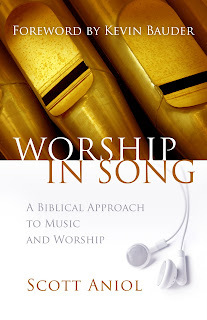 A stimulating new book on the biblical approach to music and worship has just been released by BMH Books. Entitled Worship in Song, it is written by Scott Aniol, a rising figure in the church music and musicology world. Aniol, who has studied both theology and musicology (master’s degree in musicology from Northern Illinois University), uniquely blends his knowledge of music and musical styles with a thorough study of scripture and historical approaches to music in worship. Each chapter concludes with aids for discussion so that the book may be used in small groups and classrooms. Further resources are available at www.worshipinsongbook.com or at the website for Aniol’s music and consulting ministry, www.religiousaffections.org. The 281-page paperback is fully indexed by subject and by scripture. It retails for $17.99 and the ISBN number is 9780884692621. To order, log onto www.bmhbooks.com, call (toll-free) 1-800-348-2756, or obtain through any local bookseller.